Hyland knows that happy employees perform at a higher level, increasing customer satisfaction and driving corporate performance. 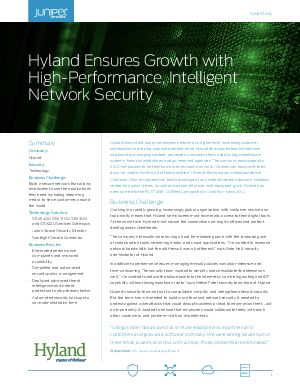 Hyland develops enterprise software solutions for managing content, processes, and cases that’s used by large healthcare systems, financial institutions, and government agencies. The company encourages its 2,200 employees to let their home lives encroach on work. Workers can easily shift their days—or weeks—to fit in all of their priorities. When at the company’s headquarters in Westlake, Ohio, employees can take advantage of an onsite Montessori daycare, wellness center, hair salon, diners, as well as two beautiful and well-equipped gyms. Hyland has been named to the FORTUNE 100 Best Companies to Work For® since 2014.